A plane powered entirely by the sun made history in the wee hours of Thursday morning after landing in Spain following a 70-hour flight across the Atlantic. 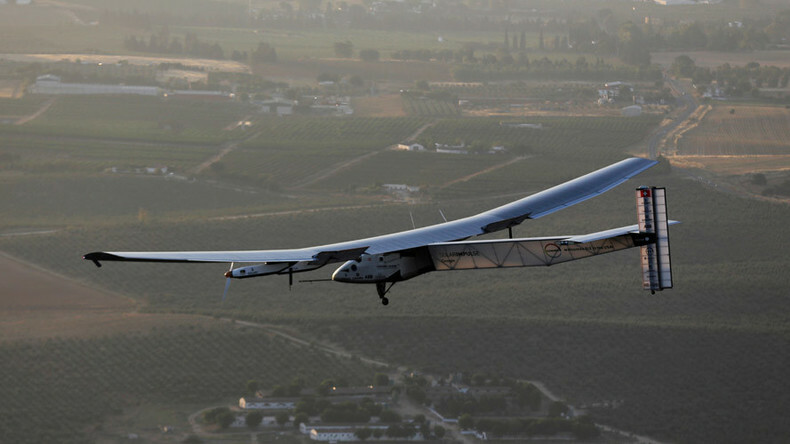 Solar Impulse 2 flew non-stop from New York to Seville, a key and risky leg in the mission to circumnavigate the globe. Originally estimated to take 90 hours, Solar Impulse 2 took advantage of the longest day of the year and arrived 20 hours ahead of schedule when it touched down at 5 a.m. local time. Crowds gathered to welcome the plane at the Seville landing strip while mission control watched it unfold from Monaco. The one-man plane piloted on this leg by Swiss adventurer Bertrand "Captain" Piccard was welcomed to Seville in style by the Spanish Air Force. More than 17,000 solar cells cover the plane which can achieve the slow and steady top speed of 80kph (50mph) when fully exposed to the sun’s rays. The team, led by Piccard and French businessman André Borschberg, had originally intended to land the craft in Paris in an effort to replicate Charles Lindbergh’s historic 1927 flight path. Storms over France meant they had to plan for Seville instead, but this may work to their advantage, according to project team member Yves Andre Fasel. "If we would have arrived in Paris like we wished, it would have been very complicated because we would have had to cross a lot of air traffic controls. From Seville, if we go along North Africa, I don't think there will be a lot of difficulties - from traffic. The difficulties will be more to do with military reasons and things like that,” Fasel told the BBC. Piccard and Borschberg have been sharing piloting duties of the craft, with Piccard enjoying occasional naps in the cockpit during the Atlantic leg of the trip. He shared details of the flight online, with images of whales, icebergs and sunsets. Borschberg flew Solar Impulse 2 more than 117 hours on the longest leg of its journey from Japan to Hawaii. The team will now have to calculate a route to their final destination of Abu Dhabi.